Technique and strategy are as important as speed and endurance in the 300-meter hurdles. 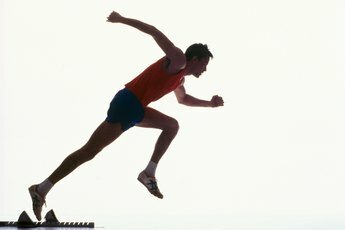 The fastest way to run a faster 300-meter hurdle race is to improve your technique and strategy. More than races without hurdles and shorter hurdle races, the 300-meter requires you to learn how to run the race properly and to develop a personal game plan for each stage of the race. While it is only one race, there are four aspects to the 300-meter hurdles: the start, hurdling, sprinting between each one and the finish. By perfecting the technique of each, you maximize your speed, which minimizes your time. Practice your start. Put the toe of your power or "smart" leg -- the leg on the same side as your writing hand -- 4 to 6 inches behind the starting line. Place your off-side toe 4 to 6 inches behind your power foot, wherever it's most comfortable. 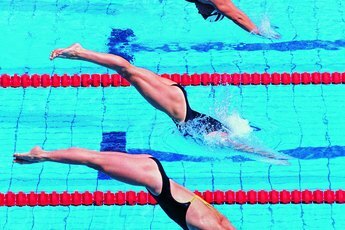 Pull the starting blocks up behind your feet and adjust the stagger of the blocks to match the placement of your feet. Stand up and step on each end of the rail to drive the blocks into the track. Get into the blocks, put both hands behind the line, your index finger and thumb creating a right triangle, the ground the hypotenuse. Raise your buttocks above your shoulders and balance your weight on your fingers and thumbs and your toes, the balls of your feet against the blocks. Explode out of the blocks by taking a step forward with your back foot and pushing off your power leg as you drive your strong-side arm forward. When your off-side foot lands before you, push off it as you drive your power-foot forward and swing your off-side arm forward. Keep your chest and eyes down as you accelerate out of the blocks. Consciously prevent the natural tendency to stand straight up until you reach full speed. Count each step from the start to the first hurdle. Count each step between the hurdles. During practice, determine the number of steps you need to take from the starting blocks to the first hurdle. Know the steps your stride requires between the first and second hurdle and each set of hurdles thereafter. Sprint in an attack position, with your chest slightly forward of your hips, between hurdles. Run on the balls of your feet. Extend your back hand behind you and your forward arm up to shoulder height as you rotate your arms back and forth at the shoulders to maintain a long stride. Count each step between the hurdles. Look down the track or around the curve rather than concentrating on the next hurdle. Watch the next hurdle with your peripheral vision without focusing on it. Hurdle on count. Perfect your timing so you know what step to hurdle on. Perfect your count to the point that it comes naturally and your count is almost subconscious. As the distance between the hurdles is constant, your step count between hurdles is typically within a single step on the straight-a-ways, maybe changing two or three steps on the curve. Lead with your knee, not your foot. Draw the knee of your lead leg up just above the crossbar of the hurdle, then extend your foot forward. Extend the hand on your arm opposite your lead leg as you lean forward, lowering your chest to your knee. At the same time, turn the toe on your trailing leg out and away from your body. Keep your chest forward as your lead leg clears the hurdle. Drop your lead leg after the hurdle. Stay in an attack position -- rather than raising your chest and reaching down with your toe -- to maintain your center of balance. Stride forward with your back leg by extending the hand on your opposite-side arm to prevent your trailing leg from taking a short step. Begin your count between each hurdle when your trail leg lands.